Lacto-ovo vegetarians eat eggs and dairy. Lacto-ovo vegetarians do not consume red meat, fish, pork, chicken, turkey, or meat products, but they do eat dairy and eggs. That means their diets might include cheese, milk, yogurt, and other related foods. Therefore, finding sources of protein for lacto-ovo vegetarians is easy because these individuals consume both dairy and eggs. There are many sources of protein for lacto-ovo vegetarians because the egg and dairy aspects of their diet open up a wealth of protein options that aren't accessible to other types of vegetarians. 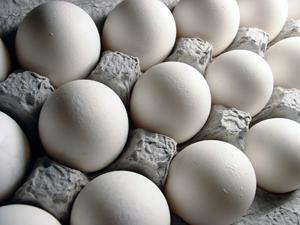 An egg contains approximately six grams of protein. A great way to get more protein in your diet is to eat eggs as part of your morning meal. Scrambled eggs and toast are a great way to start off your day. One cup of milk contains about eight grams of protein. Milk is a simple way to get protein if you're a vegetarian. Try drinking a glass with your lunch or having milk in your cereal. Just eight ounces of yogurt boasts up to 12 grams of protein. Try adding a serving of nonfat flavored yogurt to your lunch to boost your protein intake. One half cup of soy beans offers a whopping 14 grams of protein. Top a green salad with these tasty beans. A two-tablespoon serving of peanut butter includes about eight grams of protein. Spread peanut butter on two slices of whole-grain bread for a great lunch. A quarter cup of flaxseed contains eight grams of protein. Sprinkle raw seeds on your granola, or mix a few tablespoons of milled or ground flax into your morning oats. One half cup of cottage cheese contains a whopping 15 grams of protein. It's no wonder cottage cheese is widely considered to be the perfect diet food, as it comes in low-fat and nonfat options and can be eaten alone or mixed with fresh fruit for a sweet treat. Tofu includes more than two grams of protein per ounce. That means a half-cup dinner portion contains nearly 20 grams of protein. In addition to whole foods, many lacto-ovo vegetarians choose to supplement their diets with protein powders or bars. Here are a few ways to get in that extra boost of protein. 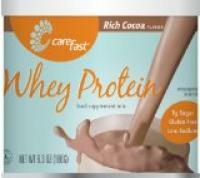 Whey Protein - Whey protein is made from milk and is available in powder or liquid form or in pre-made bars. Whey is one protein source for lacto-ovo vegetarians that is not available to vegans and those who don't consume dairy products. Soy Protein - Soy is made entirely from soybeans and is suitable for even the strictest vegetarian diets. It, too, can be found in powder, liquid, or bar forms. Pea Protein - A lesser-known protein, pea protein is made entirely from vegetables and contains nearly as much protein as most of its whey or soy competitors. Pea protein powders are widely available and can be purchased in specialty stores or on the Internet. Protein is just one aspect of a balanced diet. In order to get all the nutrients and vitamins needed to maintain a healthy weight, it's important to eat a variety of fresh fruits, vegetables and whole grains. Balance protein with other nutrients at each meal, and strive for a healthy variety in your daily diet.